This book has a lot to offer people with joint pain. I am one of them. I’ve had bone spurs on both heels of my feet since my 20s, and within the past several years they have begun to ache. My doctor thinks that it is from rheumatoid arthritis, which I have being diagnosed with having. If this were true, my joints should have been aching like this since my 20s, and it is only within the past five years that my heels (and feet) have begun to ache. On top of this, the orthopedic surgeon I saw told me that my ankles are not very flexible; they flex one way but not the other, and though he didn’t call my ankles abnormal (which I do), he did say that because the ankle flexes only one way, the tendon has been jerked on the one side since I started walking, which is why the bone spurs formed in the first place. Frankly, I’ve been lost and angry. I read this book and felt better. 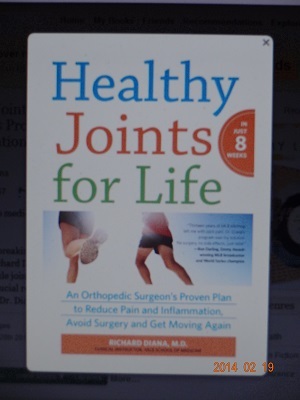 Richard Diana is an orthopedic surgeon who watched his mother suffer for years from rheumatoid arthritis. Nothing that was given to her would aleviate the pain, and he watched her world get smaller and smaller as she became crippled and not able to do much of anything. He was an NFL player and has a lot of experience with joint pain, which he has been researching for years. The book gives way too much information on the science on how the joints and the body work, at least for me. I was overwhelmed, but nonetheless struggled through. Diana says that joint pain can be controlled through weight loss, eating the right foods, and taking supplements. The body breaks down food into three groups: fats, proteins and carbohydrates. There are good carbs and bad carbs, just like there’s good fat and bad fat. There are fats and proteins that are joint-healthy, and he provides an eight-week program to get people moving while reducing the pain. People should consult their doctor before doing any of the things in this book, particularly the supplements. I also plan on consulting a nutritionist to help plan a new dietary program. Weight is a major problem, and it is imperative that I lose weight. I intend to discuss this book with my doctor when I see her. If you know someone suffering joint pain, you might want to suggest this book. If Dr. Diana were in New York, I would go to him. Note: The NetGallery pdf was so bad that I had to request the book through Warner Library. The charts and drawings were either missing or garbled.